Last weekend, my fabulous boyfriend Brian threw me a fabulous birthday party at the home we have made together in Somerville, Massachusetts. So many of my fabulous friends came in fabulous costumes, all appropriate to the party’s most fabulous theme. We had fabulous drinks and fabulous snacks. There were fabulous lip-syncs performed in my honor. A fabulous trivia game was played, the subject of which was my fabulous life. It is a fabulous life I live, isn’t it? A year ago, I was in New York City to celebrate my birthday at New York Pride, an annual twin occurrence that reassures me the Gay Gods are Real and Skilled at actualizing their Prolific Plans. Brian and I had planned to spend the weekend flitting between decadent drinks with friends and extravagent Pride events. The weekend was packed with perfect plans. But, as we all know, plans are made to be broken. A dear friend took a picture of me at my birthday party last weekend. 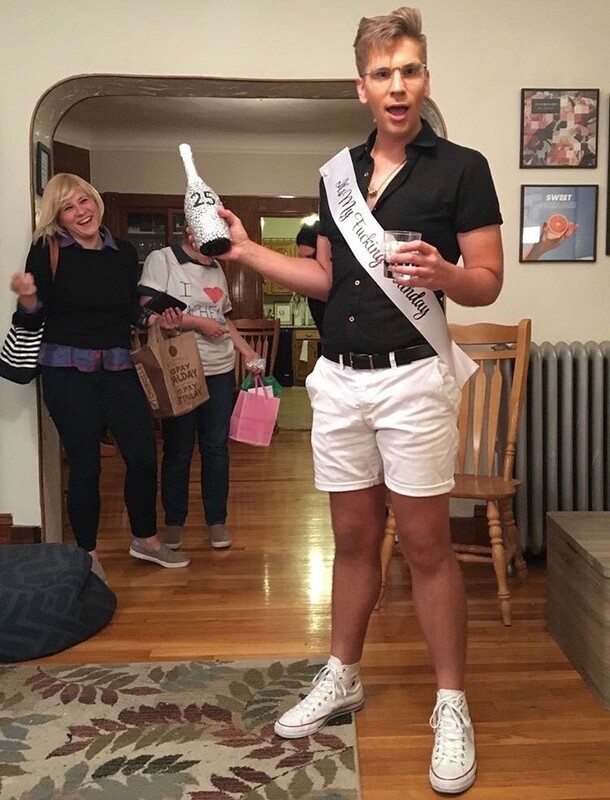 In it, I am holding a champagne bottle that was hand-stoned with silver and black rhinestones by my childhood friend Rachel. The black rhinestones were arranged to emblazon the bottle with my coming age. Twenty-five. That picture came to me in a post-party collection of photos at the end of the weekend, and it struck me as oddly familiar. Where had I seen this picture before? I looked great—in the midst of spewing some sort of signature affectionate nonsense; fit and trim; hair and early summer tan perfect. It all looked right, but it all resembled something I had seen before, too. Two months after my twenty-first birthday—which came hot on the heels of six months of self-discovery, diet, and exercise—I broke my left arm. I woke one August morning, needing to use the bathroom after a fabulous night with fabulous friends and fabulous drinks aplenty, and off I went to pee. (A lady pees sitting down, so) when I went to help myself off the toilet, all bleary-eyed and between dreams, I planted my left hand on the sinktop to my side to give myself some leverage in getting up. The sinktop was wet. My hand slipped, my elbow hit the ceramic, and something snapped. Next thing I knew, I was on the floor in unbelievable pain, eyes wide open and untimely ripped from between dreams. I dislocated my arm. Just need to pop it back into place. This is nothing! So I tried and tried in vain to wrestle my body to comfort, only excruciating it more and more with each terrible jostle. Okay, okay—OW—OKAY!! I’ll admit it. I… broke my arm. I need help. I rose to my feet and somehow managed to not only pull up my pants but also flush the toilet, before I went to alert my roommates and best friends of my plight. Though they were skeptical of my certainty that I had injured myself so badly, they took me to the hospital, and my self-diagnosis was indeed confirmed. I broke my funny bone and would spend several months in a cast and brace, showering with a plastic bag covering my left arm, attending humiliating physical therapy sessions, and miserably excusing myself from any of the physical demands of my senior year of conservatory training in acting. For quite some time, it was not a fabulous life I lived. I looked great — in the midst of spewing some sort of signature affectionate nonsense; fit and trim; hair and early summer tan perfect. It all looked right, but it all resembled something I had seen before, too. Later, I realized I had seen this picture shortly after my twenty-first birthday. A dear friend took a picture of me opening a champagne bottle (less well decorated). I looked fabulous and happy. Two months later, I broke my arm, and I let my injury insist I had reset the clock on all the growth and progress and fabulous life making I had celebrated with my fabulous friends at my fabulous twenty-first birthday party. In the time since, I have come to see photos of the fabulous, fit and trim, perfect hair and tan early summer months prior to that injury as my very own series of Haunting Photos Taken Before Tragedy. I fear—could I expect a similar series of unfortunate events yet to unfold before me following my twenty-fifth? A year ago, amidst celebrations for New York Pride and my twenty-fourth birthday, I feared for my life. My Pride Month prior was marred with sundry hypochondriac suspicions… Every headache was a brain tumor in waiting. Each pang of heart burn I registered as sign of failure, disease, or attack. Any weakness was certainly, simply anemia. So, when several hours after a heavy brunch with a best friend, my chest twinged with an unexpected feeling, I was immediately sure of the worst. This, of course, is it! Yassss, qween. Happy Pride! YOU are going to die at this Starbucks seeing your friend from your study ABROAD program, at which you FOUND YOURSELF and GOT FIT and FABULOUS!! YOU are going to die TODAY, of ALL THE DAYS, just ONE LIL BB DAY short of your twenty-fourth birthday, your golden birthday!!! SLAYYYYY!! Poetic! She loves it, it’s gorgeous!! Oh, SHE should probably CALL HER MOTHER and let her know SHE’S about to have a heart attack and DIE at the STARBUCKS across the street from the CHRISTOPHER STREET 1 TRAIN STOP. At least she gonna croak near Stonewall, HUNNY? You Know!???? Do you think they could build HER a monument for her PLIGHT? I politely exited my conversation and left my friend from my study abroad program with Brian inside the Starbucks to call my mother right outside. I returned inside and politely excused myself from my coffee date. Plans are made to be broken. Brian did his best to mask his dismay and disturbedness as we approached the PATH train to Jersey City, New Jersey. After many miserable moments dancing around our wait for the train, it arrived… and promptly filled up with commuters. Brian pushed me onto the departing train like in those infamous photos of the Japanese subway system in which some station worker is packing commuters in with a paddle. We rode in silence to my death bed, swaying with our fellow sardines. Upon our arrival, my mother picked us up and promptly transported us to her office, where my blood pressure was taken. We traipsed to the cardiologist. I drafted my final will and testament in the iPhone notes app. Tests were run. I was fine. In fact, my vitals had improved since last I visited… in a panic, a month earlier. And so we went. And we continued to celebrate, too. And it was joyous, because I was surviving every minute I lived. But for me to survive every minute meant living with the question of whether I would with each one that passed. I was exhausted… for over a year, at that point. I had unveiled an anxiety and depression and grief that was only complicated and deepened by the loss of my father and grandmother. And exhaustion, at that point, can very well become depression. It had. The journey of my twenty-fourth year on this Earth began with that insane and diffuse medical trauma, born from hypochondria and poor mental health. The journey of my twenty-fourth year on this Earth will end this weekend… in New York City, a home of mine… to celebrate New York Pride and my birthday, flitting between decadent drinks with friends and extravagent Pride events. And yes, the weekend is packed with perfect plans. I look at my past—pictures of twenty-one and twenty-four—and I realize the gift of it all. My broken arm and my hypochondria, and every strange trauma and depressive thought in between, have gilded the good in my life to a distinct pricelessness. With every passing birthday, I recognize a distinct opportunity to reflect and appreciate, to collect my experiences, and to chart my course into the future. And let me tell you—NO, I am not charting course to another personal tragedy like when I broke my arm. But!! If I do, it ain’t all that bad. I have learned so much in my quarter century about how to live with a big, beautiful, tender, bleeding heart, and I wouldn’t change a thing about the experiences that lent me my lessons. In the past year, I have learned to live with my anxiety, depression, hypochondria, grief, and body in a way of which I did not think myself capable. I have improved my health—mental and physical. In the past year, I walked my mother down the aisle at her wedding to a wonderful man with whom she’s been since I was a child… and I helped plan and execute the wedding. My family appreciated and appraised me, finally, as more than the child they helped raise. In the past year, I left my starter job—a gig that paid me very well but contributed to my deep depression by steering me well off course in terms of career ambitions—and claimed myself a burgeoning young artist in my city and in the world. In the past year, I found myself in a way not unlike that before my twenty-first birthday, so it makes perfect sense I see my younger self in the picture of me popping yet another champagne cork this year. I see you, dear. I love you, and I thank you for helping me here. Let’s work together to build the best future for us that we can. And while you’re at it, pop the champagne and enjoy the photos. It is a fabulous life you live, and I know it will only continue to shimmer and shine as you grow up through pains and pleasures aplenty.